For years, ethical issues hampered progress in stem cell research. Now, experts believe that developments in reprogrammed ‘iPS’ cells will truly revolutionise the treatment of life-threatening illnesses. It is unclear at exactly what point the phrase “stem cell” entered the vernacular, one of very few scientific terms that achieve the status of, say, DNA in not requiring a detailed explanation every time it is written down or spoken. Whether or not you know exactly what they are or what they do, stem cells imply something very specific: in them is invested the next generation of medicine, revolutionary treatments for everything from Parkinson’s to Alzheimer’s. On the horizon, there is also the hope of growing genetically matched tissue (even whole organs) to replace anything that has been damaged by disease or accident. But perhaps the reason stem cells managed to lodge themselves so deep in the public psyche was not just because of their awesome scientific potential, or their ability to turn into the treatments of the future. Perhaps it was politics. For years, stem cells dominated all other science stories in newspaper headlines because they framed an ethical conundrum – to get to the most versatile stem cells meant destroying human embryos. 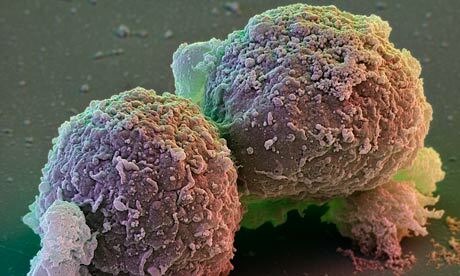 Research on stem cells became a political football, leading to delays in funding for scientists, particularly in the US. Not that the work itself was straightforward – the process of extracting stem cells from embryos is difficult and there is a very limited supply of material. Inevitable disappointment followed the years of headlines – where were the promised treatments? Was it all over-hyped? 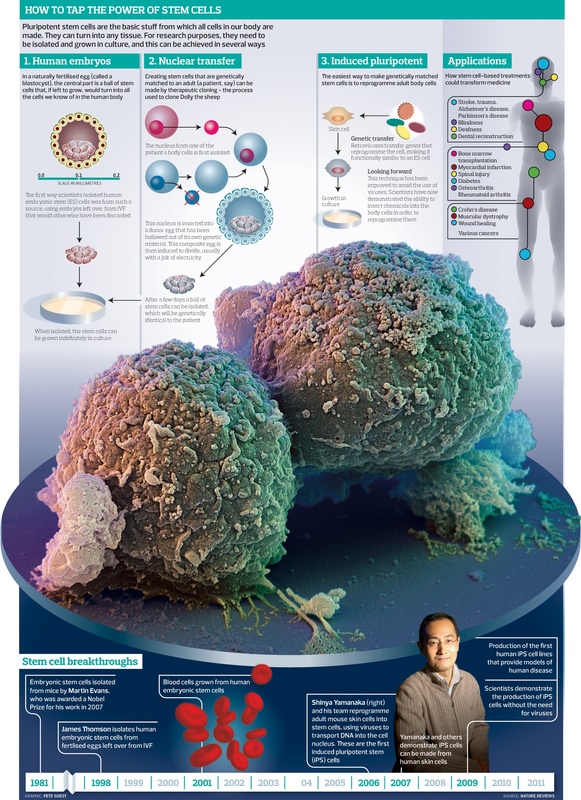 To see a full-size image of this graphic illustrating pathways to pluripotent stem cells, click here. For Paul Fairchild, co-director of the newly founded Oxford Stem Cell Institute, disappointment is just not on the agenda. Over a coffee in the University of Oxford’s pathology department, where he is a professor, he explains his vision for the coming, post-hype decade of stem cell science. Key to this is the discovery, in the past few years, of a way to make stem cells that do not require the destruction of embryos. In one move, these induced pluripotent stem (iPS) cells remove the ethical roadblocks faced by embryonic stem cells and, because they are so much easier to make, give scientists an inexhaustible supply of material, bringing them ever closer to those hoped-for treatments. Stem cells are the body’s master cells, the raw material from which we are built. Unlike normal body cells, they can reproduce an indefinite number of times and, when prodded in the right way, can turn themselves into any type of cell in the body. The most versatile stem cells are those found in the embryo at just a few days old – this ball of a few dozen embryonic stem (ES) cells eventually goes on to form everything that makes up a person. In 1998, James Thomson at the University of Wisconsin-Madison announced that he had isolated human ES cells in the lab. Finally, these powerful cells were within the grasp of scientists to experiment with, understand and develop into fixes for the things that go wrong. There were some immediate practical problems with the work. Once scientists had extracted ES cells from an embryo, they could create an immortal line of the cells to use in research. But the wide genetic variations in humans mean that scientists need lots of different lines of ES cells to treat and understand the wide variety of faults. Each new line of ES cells can only be created by fertilising an egg, and these are a precious, rare commodity. This is also where the ethical problems lie. Extracting ES cells destroys the embryo – for some, this is akin to killing a potential human life. George W Bush banned the use of federal dollars to support research using human ES cells on all but a limited number of cell lines that already existed in research labs prior to August 2001. Barack Obama reversed that ban, only to be thwarted by a federal court ruling in 2010 that, once again, put the scientists into a state of uncertainty. By contrast, the UK laws are relatively civil – after much debate about the ethics of using human embryos, the government passed strict, but fair, laws that allowed ES research to go ahead. But that did not get rid of the practical problems of a lack of donor eggs, or that the experiments with ES cells as treatments – to repair a damaged heart, for instance – were proving unsuccessful. Enter the iPS cell. In 2007, Shinya Yamanaka at Kyoto University in Japan demonstrated a way of producing ES-like cells without using eggs. He took a skin cell and, using a virus, inserted four specific bits of DNA into the skin cell’s nucleus. The skin cell incorporated the genetic material and was regressed into an ES-like cell – it had been “reprogrammed” using a batch of chemicals in the lab. In a few short experiments, scientists had a near-limitless supply of stem cells that were, seemingly, as good as ES cells for their research. By creating iPS cells from patients with genetic diseases, scientists have been able to watch which genes go wrong in a variety of conditions, how and when it happens – all of it critical detail in finding ways to stop diseases in their tracks. The method works like this: take some skin cells from a person with Parkinson’s disease and then regress these back into iPS cells. Then coax these stem cells to turn into neurons and watch how they work and, crucially, how they go wrong. These neurons are genetically identical to the patient’s own brain cells – allowing scientists to model the disease more accurately and test out ideas or even screen potential drugs. Models using iPS cells have proliferated in a few short years: they are now available for, among other things, motor neurone disease, juvenile diabetes and sickle cell anaemia. “It’s exciting to have models that we can now probe and find out what is actually going on for the first time,” says Fairchild. Traditionally, scientists use animal models of disease in order to carry out experiments or test brand new drugs – but these models are not perfect. Using human cells taken from a patient with a human disease is a more promising way of gauging what might happen in people. Fairchild has been examining how to use iPS cells to modulate the body’s immune system. It is a route, he hopes, to less rejection when people get transplants of replacement tissue. The same techniques could even develop into a better way to treat cancer. He started by differentiating embryonic stem cells into a key part of the body’s immune system called dendritic cells. These cells continually sample proteins, called antigens that sit on the surface of everything in the body. If they determine that the antigen comes from something potentially dangerous or foreign, they set the body’s killer T-cells to go after the danger and destroy it. On the flip side, the dendritic cells can also dial down the ferocity of the killer T-cells if they recognise an antigen as non-foreign. His experiments have shown that the dendritic cells do indeed stimulate the body’s T-cells to respond robustly. 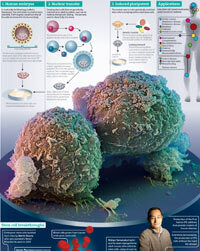 The T-cells are then programmed to find the tumour and destroy it. That means a better natural response to cancer, all without the need for toxic chemotherapy. Another way to use the dendritic cells is to dial down the body’s immune response to transplanted tissue or organs. Anyone who has a transplant needs immunosuppressant drugs for the rest of their lives to prevent their immune systems from attacking the new tissue. Stem cells offer the possibility of growing genetically matched tissue for patients, so rejection should, in theory, not be a problem. But Fairchild points out that growing matched tissue for every individual is likely to be prohibitively expensive for now. Instead, scientists would probably grow replacements from a bank of stem cells that are close matches to the majority of the population. But that means that replacement tissue would still provoke the recipient’s immune system. Fairchild’s solution is to grow dendritic cells from the same stem cells being used to grow the replacement tissue for the patient. The dendritic cells can then be used to train the recipient’s immune system that the replacement tissue is not to be rejected. The creativity in the field is exciting, but it is right, also, to point out the many technical issues facing iPS cells in moving outside the lab. Just recently, Andras Nagy of Mount Sinai hospital and Timo Otonkoski at the University of Helsinki found genetic abnormalities when creating iPS cells. In a study published in Nature, they reported the deletion or amplification of certain strands of DNA. “Our analysis shows that these genetic changes are a result of the reprogramming process itself, which raises the concern that the resultant cell lines are mutant or defective,” said Nagy.